I consider the author to be a friend. He’s a good guy and, more to the point here, a terrific writer. We did one poorly attended reading together in Charlottesville a few years ago when he published his first book (The New Valley, a collection of novellas) at about the same time my first book, In an Uncharted Country, came out. I heard him read from this new book at the AWP Conference in Seattle in early 2014 and then again at a program at WriterHouse in Charlottesville, where he was also interviewed by a professor of Russian literature. 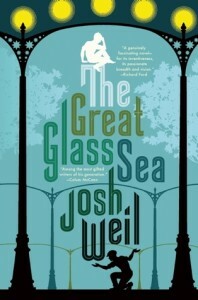 I also did an interview with Josh several years ago in which he mentions that he was at work on this novel. So it’s terrific to see the final product. The Great Glass Sea is a beautiful book. The language is lyrical, the concept (near future orbiting mirrors create endless daylight for an enormous greenhouse in Russia) is clever, and the parallel story about the relationship of twin brothers is intensely moving. I find that I’m drawn to narratives about sibling conflicts (that’s what I liked most about Elizabeth Strout’s The Burgess Boys), and that’s really at the heart of Josh’s book. So, on all those levels, this is a deeply rewarding read. It’s not a fast read, however. I confess that it took me a long time to get through the book, which is only 460 pages long—not as massive as some, but longer than most these days. But because the plot, especially in the first half, is not fast-paced, and because the language is dense, it just takes a while to penetrate. The story is about Dima and Yarik, twins who lost their father and beloved uncle at a young age, back in an idyllic world. Now, though, things have changed. A Russian billionaire has developed the Oranzheria, a massive greenhouse, and has also launched satellite mirrors that reflect light to the greenhouse to extend the growing hours. The project has monumental effects on both the environment and society, one of which is to drive the twins apart. There is already strain between them, though, because Yarik has married and had children, while Dima is left to take care of their ailing mother. While the huge project and the politics surrounding it drive the plot, what appealed to me most is the evolving relationship between Dima and Yarik. Ultimately, that’s the level on which the book satisfies.